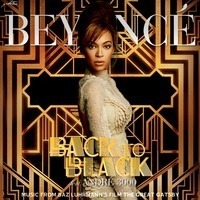 After two snippets, the full version of “Party” buddies Beyoncé and André 3000’s “Back to Black” has been unleashed for your informed judgment. Three Stacks hangs it up after about a minute and a half and Beyoncé takes it from there. We’d tell you who the premiere is courtesy of, but with their tag popping up roughly 40 times during the four-minute track, we’re sure you’ll figure it out. Now try guessing which Great Gatsby scene Baz Luhrmann will use the cover for.